Students major in contemporary dance or classical ballet, while maintaining a strong grounding in both disciplines. The Certificate in Dance Performance is a two year course designed to prepare students for a performance career. The Diploma in Dance Performance, one further year after the certificate course, focuses on providing performance opportunities and industry experience. Most graduates enter careers in dance performance, around 75% of students gaining contracts within six months of graduating. 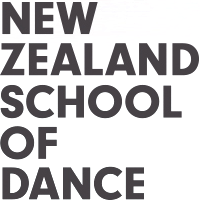 New Zealand School of Dance alumni also work in related fields such as physiotherapy, dance teaching, pilates instruction, arts administration, research, dance notation, dance photography and journalism. NZSD teaching staff offer career guidance to students on an individual basis. In addition, the school maintains ongoing relationships with the leaders of companies in New Zealand and internationally, providing information about auditions and secondments which can lead to professional employment. The New Zealand School of Dance Certificate and Diploma sit at Level 6 and Level 7 on the New Zealand Qualifications Framework. The Diploma is equivalent to an undergraduate degree, allowing the possibility of postgraduate study and many career pathways. The School is funded by the Ministry of Education through the Tertiary Education Commission (TEC) and is registered with the New Zealand Qualifications Authority (NZQA) as a private training establishment. The NZQA conducted an external evaluation and review (EER) of the School in 2017. The report states that NZQA is “highly confident” in both the educational performance and capability in self-assessment of the New Zealand School of Dance. This is the highest rating given by NZQA. The NZSD supports the New Zealand Qualification Authority’s commitment to maintaining the integrity of the New Zealand tertiary education sector. Illegal or unethical behaviour in the tertiary sector can be reported to Integrity Plus on 0800 46 36 76.